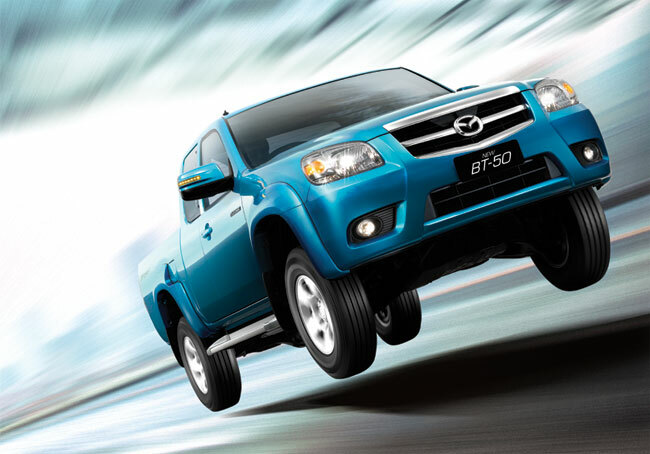 Mazda BT-50 Facelift - Flying truck? Submitted by peter on 23 February, 2008 - 10:56. No, bkkAutos.com is not shifting focus to pick-up trucks, although the last several stories have been related to pick-up trucks! 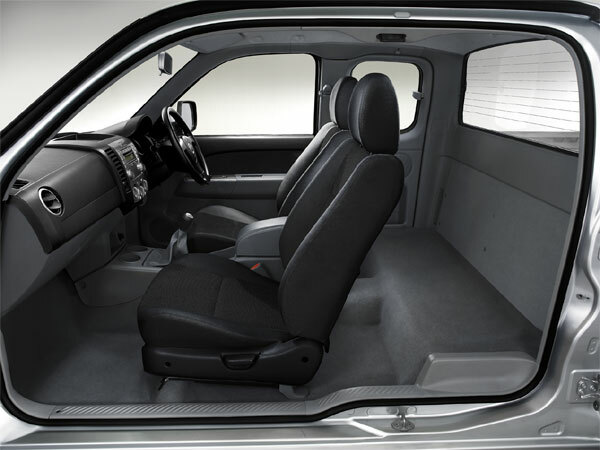 There is just more news about the truck market at the moment. Mazda have just launched the update to their BT-50 with highlights including a new suspension set up that apparently allows the Mazda BT-50 to fly, and engines that are compatible with B5 biodiesel. 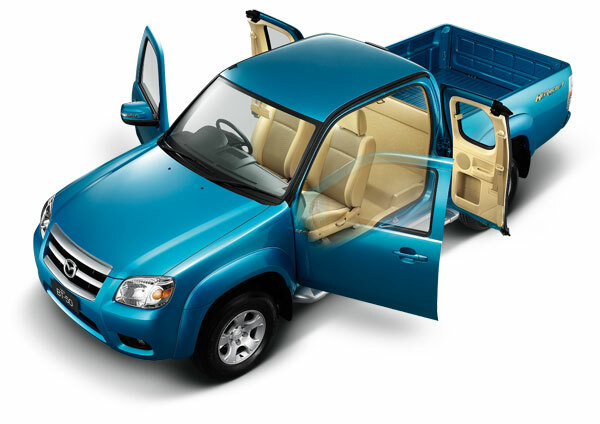 Bangkok – Thailand, February 20, 2008 – Mazda Sales (Thailand) Co., Ltd. today launched its new Mazda BT-50 pickup, which comes with the latest generation of the powerful Commonrail engine, sporty exterior and comfortable interior. Equipped with the renowned intelligent “DE-S” suspension system, the new model embodies the “Zoom-Zoom” DNA, offering state-of-the-art technology and safety system, which is sure to create a buzz for the brand. In addition, Mazda has also added a 2-wheel drive elevated Hi-Racer model at a retail price of only Baht 602,900 and plans to expand its nationwide network to 100 dealers to cater for future growth. With a revamped and more sporty exterior and interior design and equipped with the latest powerful Common rail diesel engine as well as Mazda’s unique Dynamic Enhanced Suspension (DE-S) system, the new Mazda BT-50 truly reflects the brand’s DNA -- Stylish look, Insightful detail and Spirited performance. In addition, the new Mazda BT-50 is also able to use alternative energy such as bio-diesel B2 and B5. This not only results in economical fuel consumption, but it aims to also encourage pickup owners to turn to use bio-diesel in order to support the government’s alternative energy policy. John Ray, Managing Director of Mazda Sales (Thailand) Co., Ltd. revealed, “We are proud that the new Mazda BT-50 is making its world debut through our launch in Thailand, which is recognized as an international automotive manufacturing centre for pick up production. Furthermore, we take great pride of the fact that our Mazda BT-50 has been exported to over 130 countries, and manufactured by more than 3,000 Thai employees at our plant in Rayong, where the same exacting standards as those implemented at the Mazda manufacturing plant in Japan”. In another move to further provide the highest quality standard services to the ever-increasing number of Mazda owners, Mazda plans to expand its dealer network to 100 by the end of this year. As customers have shown trust and confidence in Mazda’s after-sales services, Mazda believes that its new BT-50 pickup will be another success story for the brand, meeting customers’ needs and lifestyles. “This year, we expect that Thailand will record sales of 650,000 vehicles. Mazda is setting its target sales at 16,000 units, which represents approximately 2.5% market share. The launch of our new Mazda BT-50 today will play an important role in achieving this goal,” added John Ray. Ms. Sureethip La-ongthong, Marketing Director of Mazda Sales (Thailand) Co., Ltd., commented, “Mazda has prepared a fun and exciting media event as one of the highlight marketing activities immediately after the launch today by inviting a group of 50 media to test drive our high performance sporty new Mazda BT-50 to travel the route from Bangkok to Angkor Wat, where they will be able to see the World Heritage site, and experience the excitement of Mazda BT-50 all the way to Cambodia”. After the official launch today, Mazda will commence its marketing communications campaigns through nationwide TV, radio, print media, on-line, direct mail, and Point-of-Sales materials. Mazda will also organize road shows to promote the new Mazda BT-50 to the general public in 12 provinces nationwide in order to allow customers to come up ‘close-and-personal’ with the new Mazda BT-50. The road shows, consisting of a caravan of Mazda BT-50 pickups and Mazda 3 with special activities such as free concert, games, stunt show, will start on 8th March in Khon Khaen before traveling to Ayutthaya, Ratchaburi, Chonburi, Ubonratchathani, Udonthani, Nakornratchasrima, Chiangmai, Chiangrai, Suratthani, Nakornsrithammarat and Phuket. Three body styles models of the new Mazda BT-50 are available: the “Standard Cab” with a price of Baht 489,900 “Free Style Cab”, with a starting price of Baht 541,900 and Baht 602,900 for 4x2 and 4x2 elevated Hi-Racer, respectively, and “4-Door Double Cab” with a starting price of Baht 612,900. All new Mazda BT-50 models will be available at Mazda’s 90 showrooms nationwide immediately.